Is God calling you to a ministry of writing? If your answer is "yes" but you're receiving more rejection slips than acceptances, then Write His Answer Ministries At-Home Writing Workshops will help you to strengthen your writing and marketing skills with the goal of getting your work in print. Designed for Christian writers by Christian writers with hundreds of publishing credits and years of experience in helping others learn the craft of writing, At-Home Writing Workshops offer three courses packed with practical how-to's for becoming a writer of excellence. Click below for more information on the individual workshops that are part of each course. Workshops can be purchased individually in whatever order you prefer, or you may purchase an entire course at a discount. There is no time limit for completing your assignments. One-on-one mentoring: At the end of each workshop, you will put what you've learned into practice. Your instructor, Marlene Bagnull, will give you an objective, professional evaluation of your assignment and answers to questions you may have about writing for publication. Most assignments include a 1,000 to 1,500 word manuscript that Marlene will critique. Marlene has encouraged and equipped hundreds of writers to write for publication. If God is calling you to write, don't procrastinate! 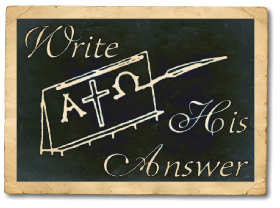 Get the help and encouragement you need to "write His answer." and revised by Mary Harwell Sayler and Sandy Brooks in the 1990s.